If the device has not been updated to at least this version, features like Profile Manager may not perform as expected. The device will display information about the update progress and any actions that need to be taken. The device may be rebooted after the update has been applied. Change the path where ADB is located and run the Install Device Runtime menu item again. Use the Device Update APK file manually. 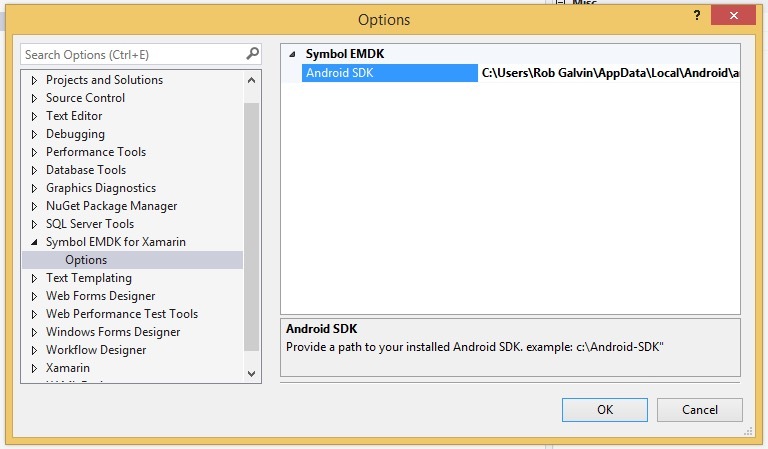 Change the line #android_sdk="" line to include your path to ADB between the quotes like: #android_sdk="C:\Path\To\AndroidSDK"
Note: Do not edit any other lines in this file, otherwise you may not be able to perform other EMDK functions like Profile Manager. 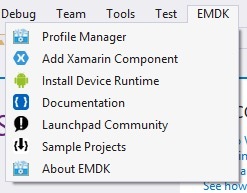 After selecting the EMDK\Apply Device Update menu option at least once, the device update APK file can be found in C:\Users\Public\Symbol EMDK For Xamarin (Win) or /Users/Shared/Symbol EMDK for Xamarin (Mac)folder. This can be used by Mobile Device Management or Staging solutions for mass deployment and update of a large set of devices. Be sure to review the Usage Notes section below for more information. Option 1: Turn Off the AppLock Manager before EMDK device runtime deployment and the AppLock Manager can be turned On after device reboot. Option 2: The customer can add the EMDK OS update app name to the AppLock Manager Applications white list before the EMDK device runtime deployment. Before installing EMDK device runtime on GMS devices, you must enable the enterprise-grade features like Mobility Extensions (MX). To download enterprise enabler for your device, go to https://portal.motorolasolutions.com/Support/US-EN and search for "Enterprise Enabler" along with the device name. The EMDK device runtime update application will skip the EMDK runtime install if a device has an EMDK runtime version higher than the install version. 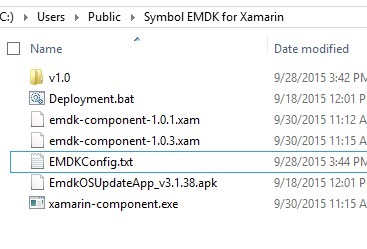 The EMDK device runtime installation behavior can be modified by pushing an EMDK install mode configuration (emdkosupdateconfig.xml) to the /enterprise/usr/ folder on a devices internal storage. This overrides the default settings of the application. NOTE: This process is not required to use the default installation behavior. InstallMode Parm Value Options: This determines the install behavior when the existing version on the device is higher than the version being installed. The default install mode is skip. RemoveInstaller Parm Value Options: Removes the EMDK OS Update application on successful update. true - Removes the EMDK OS Update application on successful update (Default). false - Don't remove the EMDK OS Update application on successful update. Note: Supported in EMDKOS Update App v3.1.37 or higher. Create emdkosupdateconfig.xml and push into /enterprise/usr/ to modify the default behavior. Push the EmdkOSUpdateApp_[version].apk to a supported Symbol device.